Obesity is a chronic disease that negatively affects the quality and duration of life . Severe obesity is a highly prevalent chronic disease, which leads to substantial morbidity, premature mortality, impaired quality of life, and excess healthcare expenditures . Laparoscopic bariatric surgery is the most effective long-term treatment for severe obesity and obesity-related comorbidities . Insufflation of the abdominal cavity with carbon dioxide (CO2) is necessary for good surgical visibility and proper surgical manipulation . The level of carbon dioxide is the most potent regulatory stimulus for cerebrovascular resistance [5, 6]. Cerebral oximetry is therefore used to estimate regional tissue oxygenation using near-infrared spectroscopy (NIRS), which is a noninvasive and continuous measurement technique used to assess the adequacy of cerebral perfusion [7, 8]. On the other hand, BIS is the most effective method for assessing depth of anesthesia and sedation. BIS monitoring reduces the number of intraoperative wake-ups in patients . Low-flow anesthesia has several potential benefits. It improves the flow dynamics of the inhaled air, increases mucociliary clearance, maintains body temperature, reduces fluid loss, results in savings of up to 75% and reduces greenhouse gas emissions and treatment costs [10–13]. However, it is necessary to examine whether the reduction of fresh gas flow affects the quality and safety of anesthesia management, especially during high-risk operations such as laparoscopic bariatric surgery. Low-flow anesthesia has been used for years with positive results, but its effects on cerebral oxygenation are not known in high-risk morbidly obese patients who are prone to pulmonary dysfunction related to the obesity. Therefore, our prospective randomized study compared the effects of low-flow (0.75 l/min) and normal-flow (1.5 l/min) anesthesia on regional cerebral oxygen saturation (rSO2) and the bispectral index (BIS) in morbidly obese patients undergoing laparoscopic bariatric surgery. This trial was approved by the Local Ethic Committee of Inonu University (Protocol no: 2017/113) and registered at the US National Institutes of Health (ClinicalTrials.gov) # NCT03438734. We conducted a prospective, randomized controlled clinical trial with 52 adult morbidly obese patients who were undergoing laparoscopic bariatric surgery in the period from June 2017 to February 2018 at a university hospital. This study was prepared in accordance with the Consolidated Standards of Reporting Trials (CONSORT) guidelines . Morbidly obese patients with American Society of Anesthesiologists (ASA) scores of III–IV, who were aged 18–65 years old, and had a BMI > 40 kg/m2 were included in our study. Patients were interviewed before surgery to obtain informed consent. Patients were excluded if they were pregnant or had uncontrolled diabetes mellitus, cardiovascular disease, pulmonary disease, cerebrovascular disease, or drug and alcohol addiction. Patients who refused informed consent were also excluded. Patients were taken to the operating room without premedication. Standard monitoring procedures were used, including heart rate (HR), noninvasive blood pressure (NIBP), electrocardiogram (ECG), peripheral oxygen saturation (SpO2), and body temperature monitoring by esophageal probe. In addition, regional cerebral oxygen saturation (rSO2) monitoring was conducted with all individuals using near-infrared spectroscopy (NIRS; INVOS 4100 Cerebral Oximeter, Software Version 7.2.5.0, Somanetics Corporation, Minneapolis, USA) and depth of anesthesia was monitored with the bispectral index (BIS; VISTA Monitoring System, Massachusetts, USA) monitoring. Two cerebral NIRS and BIS sensors were placed in the right and left frontal areas under the hairline and covered with tape to prevent exposure to light. A standardized general anesthesia protocol was administered in all patients by an experienced anesthesiologist. After preoxygenation (100% 4 l/min O2 for 3 min), propofol (1–2 mg/kg), rocuronium (0.8 mg/kg) and fentanyl (0.1 μg/kg) were administered during the induction of anesthesia via the intravenous (IV) route at doses calculated according to ideal body weights. End-tidal carbon dioxide (EtCO2) was continuously monitored after intubation. Tidal volume and ventilation rate were adjusted to maintain EtCO2 partial pressure of arterial blood at 35–45 mm Hg. Rocuronium was intermittently injected according to need based on train of four (TOF; Dräger AG, Lübeck, Germany) values. Train of four responses were assessed by ulnar nerve stimulation and adductor muscle response. 0.1–0.2 μg/kg of fentanyl was titrated for analgesia, as needed, if HR and/or mean arterial pressure (MAP) increased by 20% above baseline during surgery. Anesthesia was maintained in both groups at desflurane inhalation in a 0.5 O2 oxygen-air mixture. Desflurane was discontinued with the beginning of the skin sutures and the fresh gas flow was changed to 4 l/min of oxygen for both groups. In patients who did not experience complications during the surgery, sugammadex (IV, 2–4 mg/kg, Bridion, MSD, Greenville, USA) was then administrated to reverse residual muscle relaxation at the end of surgery. This study was planned as a randomized prospective trial. Randomization was performed with the MedCalc for Windows (medcalc.com.tr. ), version 16 statistical software. 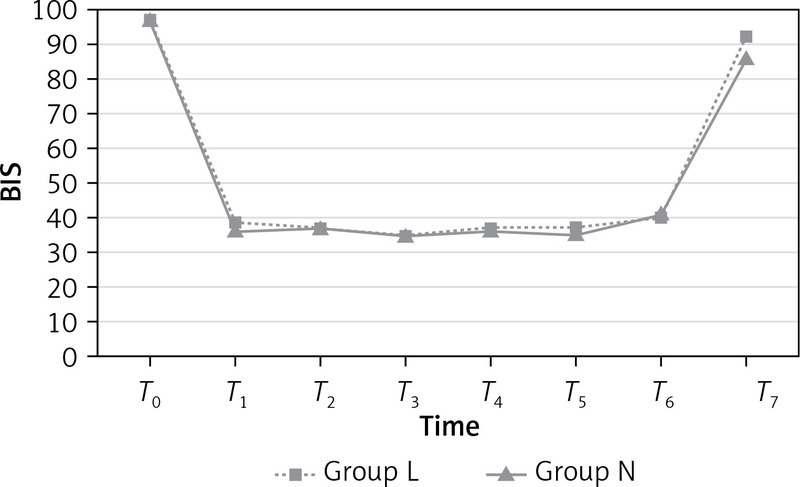 Fifty-two patients were randomly allocated to two study groups: a low-flow group (group L, n = 26) and a normal-flow group (group N, n = 26). Patients in group L received a fresh gas flow of 4 l/min for the first 10 min and were then maintained with a fresh gas flow of 0.75 l/min. 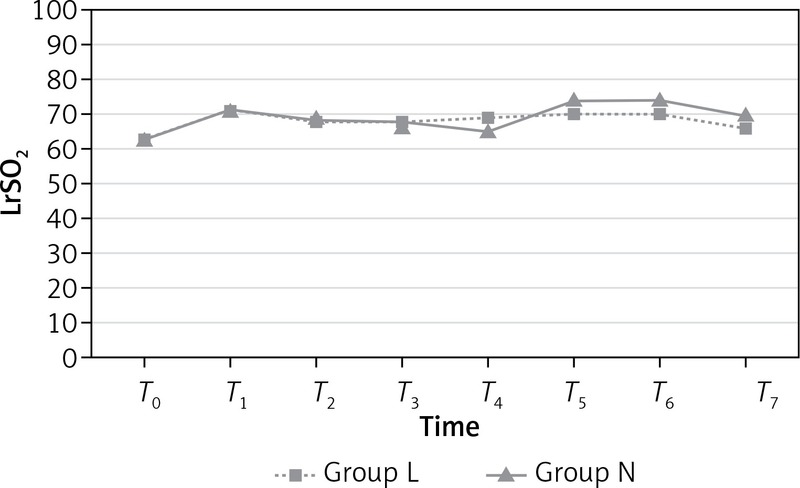 Patients in group N received the same initial fresh gas flow of 4 l/min for the first 10 min but were then maintained with a fresh gas flow of 1.5 l/min. All patients were mechanically ventilated with a tidal volume of 8 ml/kg based on ideal body weight and a frequency of 12–14 breaths/min using a Dräger Primus ventilator (Dräger AG, Lübeck, Germany). Age-related minimum alveolar concentration values were determined and expressed as a percentage of volume. All patients received the standard surgical procedures determined by the same team of surgeons with experience in gastroenterology surgery. Pneumoperitoneum pressure ranged between 10 and 12 mm Hg. Also the pneumoperitoneum level was 30–45°. Surgical management of sleeve gastrectomy was not changed in any way. Patients were transferred to the post-anesthesia care unit (PACU) after surgery. Patients were transferred to the general surgery intensive care unit when they achieved a score of 9 or higher on the Modified Aldrete score (range: 0 –12; scores of 9 and above indicate that the patient can be discharged from the PACU) . In all patients, postoperative analgesia was achieved with IV analgesic medication using appropriate doses of tramadol (0.5–1 mg/kg, IV) and paracetamol (1 g, IV) at the time of beginning skin sutures . HR, SpO2, EtCO2, MAP, BIS values, left rSO2 (LrSO2) and right rSO2 (RrSO2) were recorded before anesthesia (T0), 10 min after intubation (T1), 5 min before insufflation of CO2 (T2), 5 min after insufflation of CO2 (T3), 5 min after the reverse Trendelenburg position was applied (T4), 5 min after the supine position was applied (T5), 5 min after desufflation of CO2 (T6), and 15 min after awakening from anesthesia (T7). In addition to anesthesia and surgery times, perioperative and postoperative complications were recorded. On the basis of Kemerci’s et al. study and the assumption that a difference of 10 U on cerebral oximetry is clinically relevant, using the power calculation method (OpenEpi, Version 3), assuming an α of 0.05 and a β of 0.80, we calculated that 19 patients per group should be included in this study. Data were analyzed using the SPSS (Statistical Package for Social Sciences Statistics for Windows, Version 22.0 Software. Armonk, NY: IBM Corp). As some pre- and anesthetic characteristics of patients were distributed abnormally, nonparametric statistics was used. Quantitative data are presented as mean or standard deviation and categorical data are shown as numbers or percentages. Continuous variables were compared between the groups using the Mann-Whitney U-test. Categorical variables were summarized using frequencies and percentages (%) and compared between the groups using the χ2 test. The results were evaluated at a 95% confidence interval at a significance level of p < 0.05. The two groups were similar with respect to age, gender, height, weight, body mass index (BMI), ideal body weight (IBW), ASA physical status, fentanyl consumption and duration of pneumoperitoneum. The mean duration of anesthesia was also similar in both groups (161.15 ±41.17 min in group L and 184.69 ±46.41 min in group N), as was the mean duration of surgery (144.23 ±40.36 min in group L and 166.92 ±42.59 min in group N). Desflurane consumption was significantly lower in group L than group N (p < 0.001). Demographic and procedural data are presented in Table I. [i] ASA – American Society of Anesthesiologists, BMI – body mass index, Group L – low flow group, Group N – normal flow group, IBW – ideal body weight, n – number, SD – standard deviation. The HRs were similar in both groups (p > 0.05 for all time points). MAPs at T2, T3, and T4 were significantly higher in group L than group N (p = 0.041, p = 0.008 and p = 0.019, respectively). EtCO2 values at the same time points (T2, T3, and T4) were also significantly higher in group L than group N (p = 0.016, p = 0.001 and p = 0.002, respectively). MAP and EtCO2 values between the two groups were not significantly different at other time points. SpO2 and MAC values were similar in both groups (p > 0.05 for all time points). HR, MAP, SpO2, EtCO2 and MAC data are presented in Table II. Group L – low flow group, Group N – normal flow group. T0 – before anesthesia, T1 – 10 min after intubation, T2 – 5 min before insufflation of CO2, T3 – 5 min after insufflation of CO2, T4 – 5 min after reverse Trendelenburg position, T5 – 5 min after supine position, T6 – 5 min after desufflation of CO2, T7 – 15 min after awakening from anesthesia. * When compared with each one (p < 0.05). 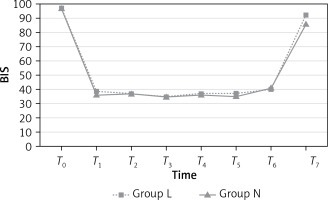 The BIS values, representing sedation level, were similar in both groups during the preoperative (T0) and intraoperative (T1, T2, T3, T4, T5 and T6) periods (p > 0.05; Figure 1); however, the BIS values at T7 were significantly higher in group L than group N (p = 0.001). BIS values are presented in Table III. LrSO2 measurements were similar in both groups (p > 0.05; Figure 2) at all time points. However, RrSO2 measurements at T7 were significantly higher in group N than group L (p = 0.018; Figure 3). Mean values (%) for rSO2 are presented in Table IV. We did not observe significant differences between low-flow and normal-flow groups with respect to HR and SpO2. Similarly, Kupisiak et al. reported no significant differences between patients who received low-flow and high-flow anesthesia during laparoscopic cholecystectomy with respect to HR, MAP, EtCO2, and SpO2; patients also did not have a high risk of awakening from anesthesia . Although we found that the MAPs of the low-flow group were significantly higher than the normal-flow group at T2, T3, and T4, the higher MAPs were considered clinically negligible because the MAPs did not increase by 20% above baseline during surgery. These results are similar to those obtained by Kupisiak et al. , even though patients in our study underwent a higher-risk surgical procedure and were morbidly obese. Fassoulaki et al. reported that BIS was equally effective for depth of anesthesia with sevoflurane and desflurane . In our study, anesthesia was maintained by desflurane because it has a shorter recovery time. We observed that BIS values in both groups were similar at all time points during the intraoperative period. Although BIS values at T7 were significantly higher in the low-flow group (mean BIS value at T7: 92.50) than the normal-flow group (mean BIS value at T7: 86.65), these results were considered clinically negligible because there were no anesthesia complications during the postoperative period, based on intensive care unit records. All patients in our study met the threshold criteria for morbid obesity with a BMI of 40 or more. The mean duration of anesthesia (nearly 160 min) was longer than those. Despite this, patients in our study experienced no cerebrovascular events during the postoperative period, according to intensive care unit records. Identification and prevention of risk factors for reductions in cerebral oxygenation are crucial tasks for all anesthetists . Keeping regional cerebral saturation at safe levels during surgery may reduce perioperative complications and shorten the length of stay in the hospital . We did not observe any reduction of the cerebral oxygenation compared to the baseline. Although the fresh gas flow rate was different, we provided oxygenation using the appropriate oxygen concentration. Higher BMI scores are associated with reduced functional residual capacity and oxygenation index, increasing respiratory system resistance and workload. A BMI score over 40 kg/m2 becomes an important predictor for lung volumes, respiratory mechanics, and oxygenation in patients undergoing general anesthesia . Laparoscopic bariatric surgery has many benefits compared to conventional open surgery, such as less postoperative pain, shorter hospital stays, and faster recovery times . 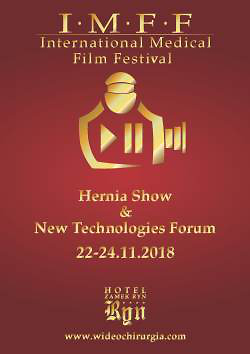 However, changes in body position are required in laparoscopic bariatric surgery which can cause significant hemodynamic and respiratory changes that can reduce brain perfusion and oxygenation . Specifically, laparoscopic bariatric surgery requires that patients be placed in a reverse Trendelenburg position with long-duration pneumoperitoneum for good surgical visibility and proper surgical manipulation. In addition, insufflation of the abdominal cavity with CO2 during laparoscopy results in increased intraabdominal pressure, hypercapnia, and systemic vascular resistance, and decreased functional residual capacity and pulmonary compliance. Similarly, elevated thoracoabdominal pressure disturbs cerebral venous drainage, and CO2 absorption dilates the cerebral vessels and increases cerebral blood volume. This can lead to significant changes in cerebral homeostasis, which in turn can lead to cognitive dysfunction [24, 25]. Gipson et al. found significant decreases in cerebral oxygenation associated with neurocognitive changes after 10–12 mm Hg pneumoperitoneum . It is therefore crucially important to monitor cerebral oxygenation levels during laparoscopic bariatric surgery. However, it can be difficult to predict cerebral hypoxia when patients are in the Trendelenburg position required by laparoscopic bariatric surgery, due to the reduced intracranial pressure and cerebral blood flow . Yi Jo et al. also reported that cerebral oxygen and EtCO2 values were significantly increased after pneumoperitoneum during laparoscopic bariatric surgery, but that there was no change of cerebral oxygen saturation in any of their patients . In our study, we observed that no significant changes in cerebral oxygen saturations during the entire intraoperative (T1, T2, T3, T4, T5 and T6) period. Although there was a statistically significant difference between the low-flow and normal flow groups for RrSO2 at T7 (64.69 and 71.65, respectively), this difference was considered clinically unimportant, and neither group had a clinically superior outcome in terms of cerebral oxygenation. Our study did not include the use of transcranial colored Doppler and jugular bulb oxygen saturation, which can help monitor cerebral function. We also did not include cognitive function assessments during the postoperative period, which could give more reliable results. Further research should make use of these measures of cerebral functioning. Our study examined the effects of low-flow vs normal-flow anesthesia on hemodynamic and respiratory characteristics, depth of anesthesia, and cerebral oxygen saturation in morbidly obese patients during laparoscopic bariatric surgery. No significant perioperative or postoperative complications were recorded among our sample. While a few differences between the two groups reached statistical significance, all results were within normal ranges and none of the differences suggested any meaningful clinical differences. We therefore conclude that low-flow anesthesia can be used safely with morbidly obese patients during laparoscopic bariatric surgery.